(Host) On Town Meeting Day, voters in the small town of Monkton will be weighing in on a $1.5 million renovation of the town hall and library, as well as the town budget, and replacing a culvert on a busy town road. 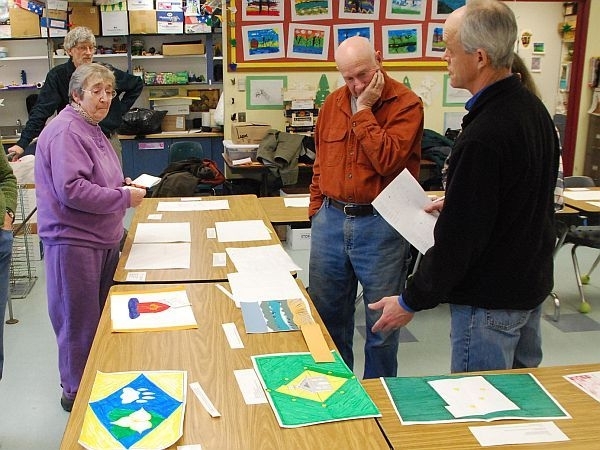 And as VPR’s Melody Bodette reports, those attending town meeting will also be asked to pick a town flag. (Bodette) For people living in small towns, especially those without kids in schools, getting to know your neighbors can be a challenge. The Monkton Community Coffeehouse has worked for several years to create events to help people get to know each other. With the 250th anniversary of the town’s founding coming up, organizer Jonathan Corcoran had an idea for another community-building experience. (Corcoran) "What better idea could there be than to create a town flag? To bring people together to really think about what makes Monkton unique, what makes it special, what do we love about living here?" (Bodette) Corcoran says designing a flag means people have to think about the town’s symbols and what’s important to them. The idea got started on Monkton’s email discussion list. A consignment shop helped out by awarding a grant. The art teacher at the town school assigned sixth-grade students work on designs. Boy Scouts did the same and other townspeople got involved. In the end, 34 designs were submitted. Then, a panel of eight judges narrowed the contenders to the top five. Details of those designs are being kept secret for now, but Corcoran says some common themes highlighted the town’s rural character. (Corcoran) "It’s a very beautiful town because we’re actually in the foothills of the greens. If you look at it topographically, it’s all hills and open spaces. There’s also a lot of wildlife here." (Bodette) Entries also highlighted iconic town buildings, conservation and agriculture. The top designs are now with a graphic artist who’s working to digitize the image. On Town Meeting Day, the voters will fill out a ballot with their top three picks. The winning design will be unveiled at the town’s 250th birthday celebration on June 24th. It will also be transformed into a postmark to be added to letters on that day.